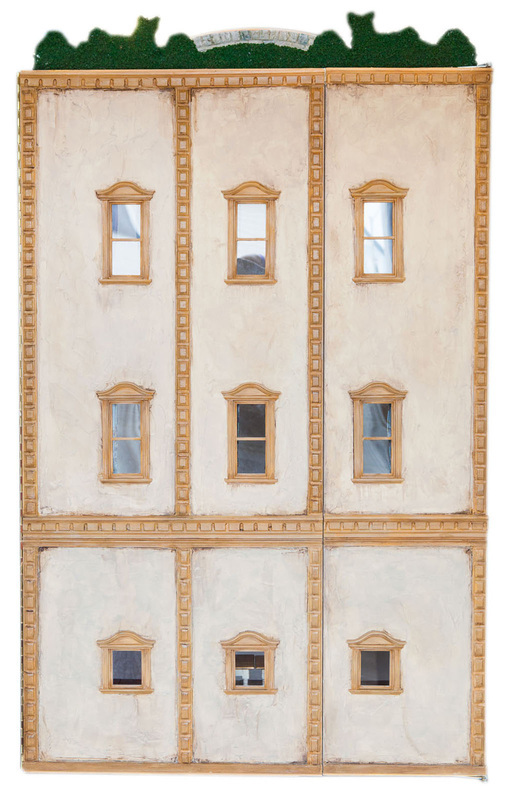 This 1/12 scale Early Georgian Doll House features 3 large floors and a roof top garden. The original piece of furniture was the top from an old kitchen sideboard. The front has a pretty wood carving at the top and I added a stuccoed back and large windows to the house. 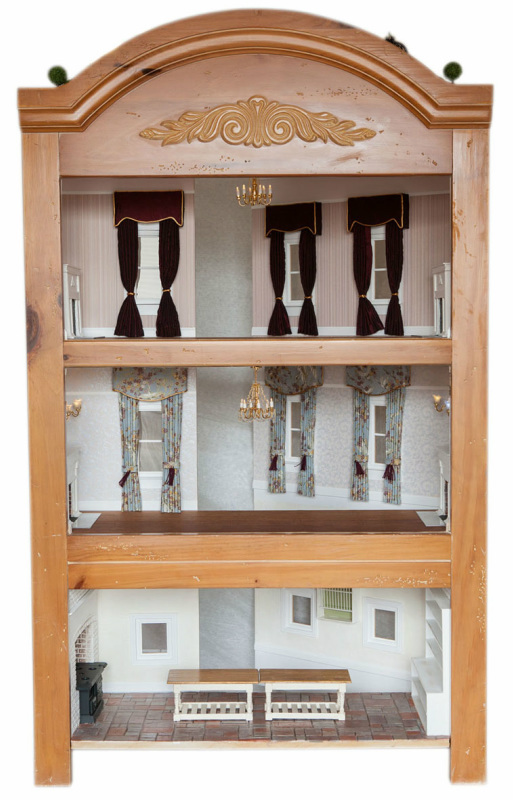 This doll house views from the front, but the back also opens. You can display it from either side. It comes with a lovely table to feature the house, and the house rests on a 'lazy susan' so it easily turns from front to back. It comes with everything you see in the pictures, including 8 battery operated lights. I am very excited about this his doll house. Almost everything was made by hand. The chandelier on the first floor is not made by me, as I use battery operated lighting in my dollhouses but I did add lots of crystal beading to chandelier to make it a real focal point to the room. It features four handsome fireplaces with a large mirror above the two fireplaces on the center floor! The top two floors have long curtained windows, which can be easily removed and each has beautiful period wallpaper. The kitchen has a large cooking stove, two kitchen tables, lots of shelving and a hanging plate rack. Two floors have a battery operated chandelier and the center floor features double sconce lights on each side of the fireplace. These lights can also be easily moved. The chandeliers each hang below a carved cornice and faux 'plastered' ceiling. Really lovely! The rooftop garden is landscaped with handmade lavender plants and topiary bunnies that create a wall on one side of the garden. Smaller plants border the stone paths. It has a high stone wall where a water fountain spews water at tiny Koi fish swimming below. A large birdcage can hold a collection of miniature birds. A tiny bench, a flower pot and turtle complete this roof top paradise. There is still lots of room for a happy gardner to fill this unique doll house garden with more plants and flowers. • Real wood flooring on two floors and faux 'stone' flooring in kitchen.